THE OOCL BERLIN SAILED INTO NEWARK BAY TO DOCK AT MAHER TERMINALS: AT 13,208 TEU, the Berlin is the largest vessel to transit under the newly elevated Bayonne Bridge roadway. OOCL sailed the largest container ship to date into the Port of New York and New Jersey. Carrier alliances have announced their intention to deploy vessels of up to 18,000 TEU to the Port of NYNJ. The Berlin will be joined by a sister ship of identical size, the OOCL Malaysia, later this summer. On July 17, Orient Overseas Container Line (OOCL) sailed the largest container ship to date into the Port of New York and New Jersey. The OOCL Berlin sailed into Newark Bay to dock at Maher Terminals Berth 68. A 13,208 TEU vessel, the Berlin measures longer than 1,200 feet (or the equivalent of four football fields) and is the largest vessel to transit under the newly elevated Bayonne Bridge roadway. To date, the longest ships to call New York and New Jersey terminals have been 1,000 feet long. Docking pilots from McAllister Towing and Transportation handled the Berlin, which is operated in a vessel sharing agreement with Ocean Alliance (OA), partners CMA-CGM, COSCO Shipping, and Evergreen. The vessel was rotated to the Port of New York and New Jersey to load empties on one of its many all-water east coast services. 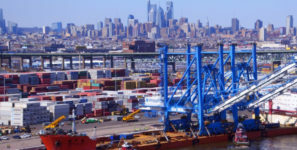 The OA and other carrier alliances have announced their intention to deploy even larger vessels of up to 18,000 TEUs to the Port of New York and New Jersey as cargo demand grows and as fewer east coast ports are able to provide infrastructure sufficient to safely handle and work ships of this size. Staff from the Port Authority of New York and New Jersey welcomed Captain Syed Khoda, Director, OOCL (USA) Inc., of Salt Lake City, along with officials from Maher Terminals in presenting a plaque marking the occasion to the master of the Berlin, Captain Tan Chen Seng. Three other ships from the same group — the OOCL Korea, the OOCL Chongqing, and the OOCL France — are being considered for future rotation to New York and New Jersey, based on market conditions in the second half of 2017.